Is feeling depressed a natural part of aging? Though growing older is not always easy, many are able to adjust just fine. Others struggle with depression, though, and any depressive symptoms should definitely be addressed. Growing older is not always an easy process. Depression can occur in every age across the lifespan but older people are at a higher risk. 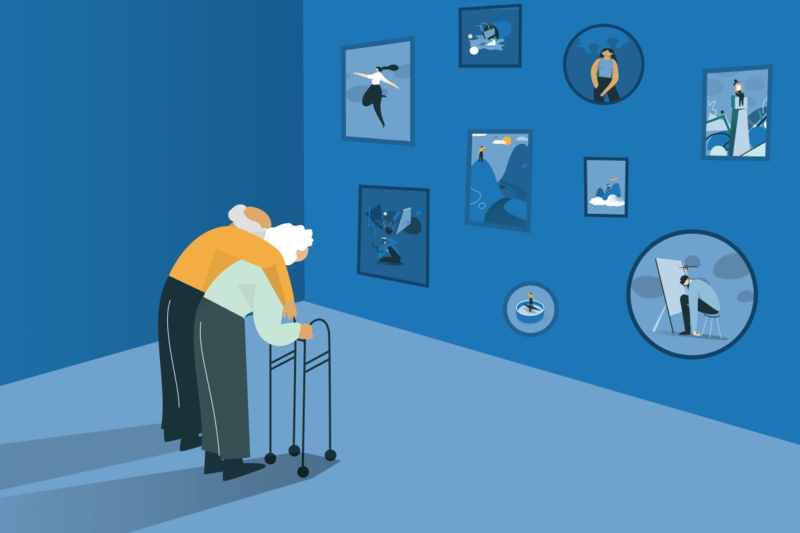 Because of global demographic change and the increasingly aging population, the number of elderly with depression is rising, thus becoming a more and more important topic for the health sector. According to the Geriatric Mental Health Foundation, around 15–20% of the population aged 65 years and older in the United States experience depression. This alarmingly high number can have severe outcomes for the affected individual and their environment. Why are older people more vulnerable to depression? Feeling depressed can have many different causes. Interestingly, next to sleep quality and general health, perceptions about aging play a big role in depression. Attitudes about aging can inform expectations and outcomes of getting older, rooted mainly in society. As this study shows, when we have a more positive attitude toward aging, we are likely to retain better mental health and face fewer depressive symptoms. Additionally, elderly people can struggle to find good sleep—a fundamental need. We all know that it can be pretty difficult to get through a day after a sleepless night. Therefore, it is not surprising that many studies found a connection between insomnia, reduced life quality, and depression. Further, aging usually comes along with less social engagement and decreased contacts in daily life. When we retire, we might decide to relocate our home and maybe move to a different neighborhood. This might lead to losing close friends, co-workers, or long-standing neighbors. Death of a spouse, friends, and other family members may also contribute to feelings of loneliness and sadness. There are also profound life changes that come with age. Leaving our professional life is a major one, since many find a sense of purpose and social engagement through work. Physical changes and illnesses that come with age can additionally restrict what we’re able to do, which, in turn, negatively impact our mood. These circumstances make depression more likely. And the gradual onset of depressive symptoms makes it difficult to notice differences between simply feeling sad and an actual depressive episode. Can you tell the differences between depression and dementia? It can be very helpful to know how to tell the difference between feeling sad or actually depressed, or even illnesses like dementia, especially if someone in your close environment might be dealing with elderly depression. This is difficult sometimes, as the symptoms are closely interlinked, and depression can co-occur with dementia. Dementia should not be confused with “pseudodementia,” a condition that can occur at any age that is part of a larger diagnosis of depression. This is a condition that affects concentration and memory but it recedes with the depressive episode is not true dementia. The following lists should make it easier for you to understand the differences between the two. So, is there anything that can be done to stay healthy? Feeling depressed can have an impact on our overall well-being, and may lead to disability, higher mortality, or even suicide. Therefore, trying to prevent elderly depression is an important aspect of healthy aging. Engaging in group activities in the community: Participating in activities can have many benefits when we age. This can not only be an opportunity to strengthen your social network, but also give structure to our daily life and prevent us from feeling a loss of interest or pleasure in activities, all of which are common signs of depression. Daily exercise: Aerobic exercise—like swimming, biking or running—has been proven to not only prevent depression in older adults but keeps the brain fit! Keeping the body active also enlivens the mind and can help reduce stress or the negative thought chains of rumination. Healthy nutrition: Our diet plays an essential role in both our physical and emotional health. Multiple studies show that specific foods (e.g., fruits, vegetables, Mediterranean diet) can prevent depression. So, we need to be conscious of what we eat to stay healthy! Be aware of medication: When we get older, we usually deal with more physical impairments and health problems, which may result in taking a lot of medication. However, if we tend to feel depressed easily, this might be triggered by the medicine we are taking and should always be considered when experiencing the first symptoms of depression. How can elderly depression be identified? Only 10% of elderly people with depression receive adequate treatment. Clearly, many currently suffer for a much longer time than is necessary. Older people and their families or caregivers may mistake their symptoms of depression with other diseases or dismiss them as being an ordinary part of the aging process. Knowing about depression and what to look for may help those affected act more quickly to seek appropriate solutions and improve the current situation! Find out now if you are affected by depression by downloading our app, Moodpath. And you can learn more about signs of depression in the course “What Is Depression”.